One hundred and fifty years ago, the corporation was a relatively insignificant entity. Today, it is a vivid, dramatic and pervasive presence in all our lives. Like the Church, the Monarchy and the Communist Party in other times and places, the corporation is today’s dominant institution. But history humbles dominant institutions. All have been crushed, belittled or absorbed into some new order. The corporation is unlikely to be the first to defy history. In this complex and highly entertaining documentary, Mark Achbar, co-director of the influential and inventive Manufacturing Consent: Noam Chomsky And The Media, teams up with co-director Jennifer Abbott and writer Joel Bakan to examine the far-reaching repercussions of the corporation’s increasing preeminence. Based on Bakan’s book The Corporation: The Pathological Pursuit of Profit and Power, the film is a timely, critical inquiry that invites CEOs, whistle-blowers, brokers, gurus, spies, players, pawns and pundits on a graphic and engaging quest to reveal the corporation’s inner workings, curious history, controversial impacts and possible futures. Featuring illuminating interviews with Noam Chomsky, Michael Moore, Howard Zinn and many others, The Corporation charts the spectacular rise of an institution aimed at achieving specific economic goals as it also recounts victories against this apparently invincible force. John Kenneth Galbraith, lifelong critic of unbridled corporate power and one of the most renowned economists of the twentieth century, delivers a scathing polemic on today’s economics, politics and public morality. Sounding the alarm on the gap between ‘conventional wisdom’ and reality, Galbraith distils years of expertise in this radical critique of our society. He shows the danger of the private sector’s unprecedented and unbridled control over public life – from government to the military to the environment. And he reveals how politicians and the media have colluded in the myths of a benign ‘market’: that big business always knows best, that minimal intervention stimulates the economy, that obscene pay gaps and unrestrained self-enrichment are an inevitable by-product of the system. The result, he shows, is that we have given ourselves over to a lie and come to accept legal, legitimate, innocent fraud. 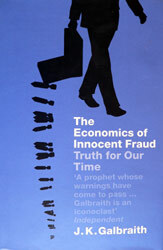 Galbraith’s analysis purports to show that the gulf between truth and illusion has never been wider. It is essential reading for anyone who cares about the economic and political future of the world. Here is the paradox, the word “work” embraces equally those for whom it is exhausting, boring, disagreeable, and those for whom it is a clear pleasure with no sense of the obligatory … but that is not all. Those who most enjoy work – and this should be emphasised – are all but universally the best paid. This is accepted … the wages, or more precisely the salaries, bonuses and stock options, are the most munificent at the top, where work is a pleasure … Nor until recently did the inflated compensation and extensive perquisites of functional or nonfunctional executives lead to critical comment. The myths of investor authority, of the serving stock-holder, the ritual meetings of directors and the annual stockholder meeting persist, but no mentally viable observer of the modern corporation can escape the reality. Coporate power lies with management – a bureacracy in control of its task and its compensation. Rewards that can verge on larceny. This is wholly evident. On frequent recent occasions, it has been referred to as the corporate scandal. Here another largely accepted manifestation of fraud. It occurs when a less than successful venture encounters the adverse forces of reality. The causes of reduced corporate performance have been realised. They are, invariably the same – impersonal market forces, absent public restraints, simple theft. The universal remedy: vigourous downsizing – layoffs of the least responsible. The larger the number so released, the better regarded the financial prospect. i am having an arguement with my friend. he doesnt believe that the info about cows milk in the show is real, and i need to prove him wrong. can you tell me where to buy this awsome show, so i can kick his arse.